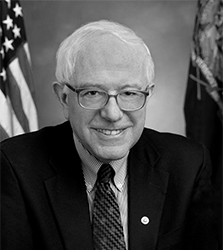 Bernie Sanders, an independent member of the U.S. Senate, is Vermont’s junior senator. He announced on April 30, 2015, that he was running for the 2016 Democratic presidential nomination. Although Sanders caucuses with the Democratic Party in the Senate, he self-identifies as a “democratic socialist.” His record leaves little doubt that this is an accurate assessment. Sanders’ rhetoric revolves largely around corporations and what he sees as the damage they have inflicted on the American economy and workers. In most regards his anti-corporate rhetoric falls within the mainstream of most elected Democrats, although he probably spends more time on it and more explicitly casts his rhetoric in terms of socialist principles than any other. Sanders was expected to be a back-of-the-pack candidate in the Democratic nomination fight, but he has surprised many by becoming the leading challenger to the favored nominee, Hillary Clinton. He effectively tied Clinton in the Iowa caucuses and beat her by 22 percentage points in the New Hampshire primary. His fundraising has been substantial, and in January he raised more than Clinton did. However, he lost the Nevada caucuses by five percentage points and was crushed in South Carolina, receiving only 26 percent of the vote, in large part because of his poor showing among African-American voters. Although he managed to win four out of 11 states on Super Tuesday and win the Michigan primary a week later, his mid-March losses in Florida, Illinois, Missouri, North Carolina and Ohio have put him well behind in the delegate count, and it will be difficult for him to find a path to the nomination barring a complete collapse of his opponent. Although Sanders has been a harsh critic of what he calls “mass incarceration” and a criminal justice system he says imprisons too many people, as a member of Congress he has voted for many of the bills that have increased criminal penalties, such as the 1994 Clinton-era Omnibus Crime Bill that expanded use of the death penalty and required states to limit early release programs in exchange for federal funds.16 While this is not completely inconsistent with his rhetoric, it does suggest he has cast votes that helped produce the very outcomes he decries. Sanders’ wife, Jane O’Meara Sanders, left her position as president of cash-strapped and faltering Burlington College with a $200,000 “golden parachute” after she lost support of the board to continue in her position.17 Bernie Sanders has been highly critical of CEO compensation, including “golden parachutes” given to terminated executives. Sanders has proposed spending $1 trillion over a five-year period on public infrastructure such as roads, bridges and airports,85 and combined with his other spending proposals he would increase total federal spending by at least $18 trillion over the next ten years if his policies were implemented.86 The bulk of that new spending would be for a single-payer health care system. He voted against the 2003 legislation creating a Medicare prescription drug benefit97 and characterized it as “written by the insurance companies and the drug companies.”98 He has co-sponsored legislation allowing prescription drugs to be re-imported from countries with price controls99 and also to permit Medicare to directly negotiate prices with drug companies,100 which many consider to be a form of price controls. Sanders has also proposed eliminating patent protections for all pharmaceuticals, instead offering government-funded prizes for drug innovation. Under his proposal the government would determine how valuable a drug was by considering the severity of the condition treated, the size of the affected population, and other information, and provide an award to the drug’s developer.101 All drugs would then be produced as generics. In 2011, Sanders created a “panel of experts” to help him draft legislation that would reform the Federal Reserve. He did this in the wake of a report that faulted “apparent conflicts of interest by bank-picked board members at the 12 regional Fed banks.”124 The “panel of experts” assembled by Sanders were all, with the exception of one, members of academia and not practitioners in the financial or banking industry. In the course of his career, Sanders has defended Israel.135 In 2014, when confronted in a town hall by Vermont constituents over Israel’s military actions in response to rockets launched by Hamas, Sanders observed that he thought Israel had “overreacted” but explained Hamas had been launching rockets from populated areas. He became extremely agitated and testy when anti-Israel constituents argued with him and defended Hamas. Sanders was a co-sponsor of the Media Ownership Reform Act of 2005, which would have reinstated the “fairness doctrine” in talk radio,173 which most observers believe would curtail conservative-oriented speech. Sanders voted against a constitutional amendment protecting religious liberty,176 and he was critical of the Supreme Court’s ruling in the Hobby Lobby case protecting religious employers. Sanders supported the No Child Left Behind education bill182 but later supported an overhaul of the legislation that would end the requirement that schools show progress toward meeting federal goals.183 Sanders opposed standardized testing in schools because it “narrows school curriculum and constrains the development of critical thinking and creativity.184 He is opposed to school vouchers and parental choice in education. Sanders has few vulnerabilities in terms of ethics or instances where he has changed positions, although there are a few examples, as is to be expected of someone who has spent more than 30 years in public office. Sanders has few actual legislative achievements to his credit, the legacy of holding starkly anti-corporate views that are well out of the mainstream even of the Democratic Party. This lack of accomplishment is likely to be seized on by rivals in 2016. Coming from nearly all-white Vermont, Sanders has little familiarity with the racial politics that are crucial to securing the Democratic nomination. He has already stumbled a few times on this issue, according to those who follow the intricacies of the issue, such as failing to mention immigration or problems facing the African-American community in his announcement speech. Sanders’ generally unimpressive speaking and political skills have not yet proven to be a liability on the campaign trail, but it is questionable whether he would have the ability to overcome a high-profile blunder of the sort that all candidates make at some point. Please select up to 4 candidates.